Divide sliced tomatoes and avocado into four salad plates or bowls. 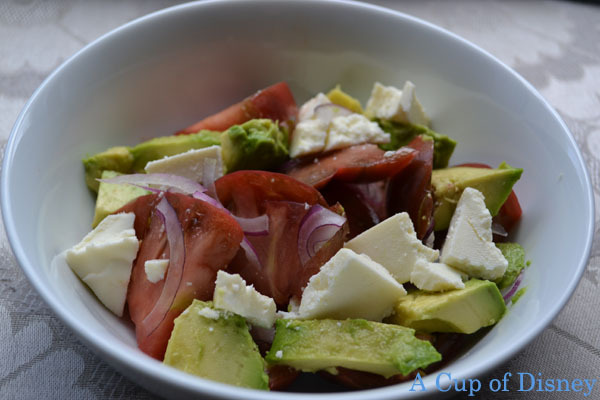 Top each salad with red onion and queso fresco. Drizzle 2 teaspoons of dressing over each salad. Marinate the onions in the vinegar, spices and half the olive oil for a couple of hours. I used a medium sized mixing bowl. Season the onions with salt and grill until they become slightly black and soft. Keep the marinade for later. Chop up the charred onions and place back into the marinate and let them drink up the vinegar and olive oil for about an hour. Whisk in the rest of the oil into the mixture and season with salt and pepper. *For the vinaigrette, I made a replica recipe based on taste.